This paper addresses the relationship between vulnerability and climate change induced human population displacement. Anthropogenic climate change is increasingly altering the way people live. A significant consequence of the effects of climate change is human displacement due to climate effects such as hurricanes, sea level rise, and drought. People displaced by the effects of climate change suffer from a legal protection gap. Increasing global attention is being addressed at closing this gap. 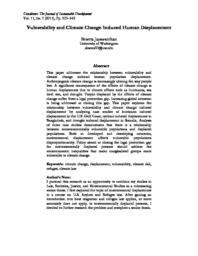 This paper explores the relationship between vulnerability and climate change induced displacement by analyzing case studies of hurricane induced displacement in the U.S. Gulf Coast, cyclone induced displacement in Bangladesh, and drought induced displacement in Somalia. Analysis of these case studies demonstrates that there is a relationship between socioeconomically vulnerable populations and displaced populations. Both in developed and developing countries, environmental displacement affects vulnerable populations disproportionately. Policy aimed at closing the legal protection gap for environmentally displaced persons should address the socioeconomic inequalities that make marginalized groups more vulnerable to climate change.